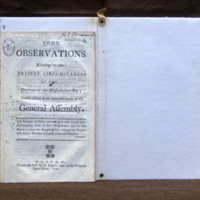 Some observations relating to the present circumstances of the Province of the Massachusetts-Bay; humbly offered to the consideration of the General Assembly. Boston: Printed and sold by Daniel Fowle, next to the prison in Queen Street, 1750. Signatures: [A]4B4C2 (20 pages); 20 cm. Unknown number of copies printed of a political tract published in Boston by Daniel Fowle, a printer specializing in pamphlet publishing. The political tracts of the period were published anonymously and like the one described here, frequently captured the undercurrents of resentment against colonial rule. Twenty-three copies are currently located in North American and Great Britain libraries. Slipcase: This volume is bound in full red morocco leather over heavy boards. Both front and back panels are outlined by a single blind fillet with three gilt dots at the top and bottom corners, and two gilt dots at the top and bottom corner at the spine edges. 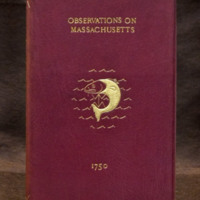 The front cover is decorated with a codfish motif above seven rolls of wavy gilt lines. The body of the fish is in solid gilt, with the head and facial features in a gilt outline. Morse’s monogram, “WIM,” is gilded and partially encircled by the fish’s body. 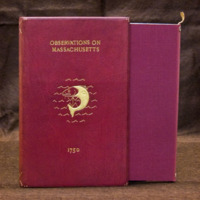 The abbreviated pamphlet title, OBSERVATIONS ON MASSACHUSETTS, is gilded and centred above the codfish motif with the year 1750 centred in gilt below the codfish motif. 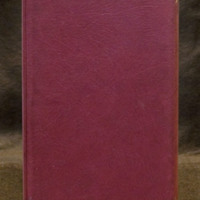 The volume’s rounded spine features blind fillet at the head and tail, and Morse’s monogram is repeated in gilt on the head and tail of the spine, along with the abbreviated pamphlet title, in gilt, on the spine. Front and back panels are outlined in single blind fillet on all four edges, with single gilt dots in each of the four corners. A single blind fillet with four gilt dots are in each corner and outline the edges of the boards at the opening edge at the top and the bottom. There is a quarter of an inch leather turn-in. The slipcase is unlined. Inner Folder: The inner folder of the book features cloth-covered boards lined with soft white felt. The spine panel includes metal eyelets at the head and tail with a three centimeter leather pull at the head of spine, which is held in place by the top eyelet. The elegant codfish motif on the slipcase cover is the most eye catching element on the slipcase binding. The few wavy gilt lines in the cover motif effectively give a sense of place and motion. The insertion of the “WIM” monogram in the main decorative feature is well-executed. The fine binding that encases the pamphlet pays tribute to the historical significance of the early colonial pamphlet which recounts New England involvement in returning Cape Breton to the British.